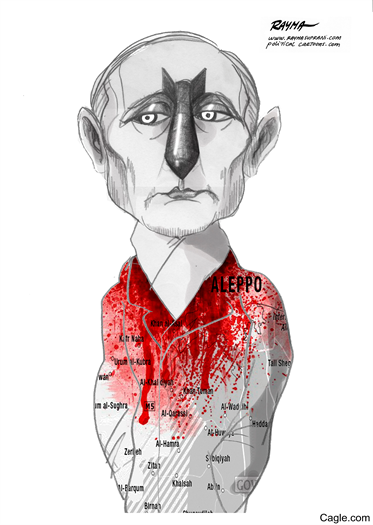 This cartoon from Rayma Suprani is a reminder U.S. news media have reported President-elect Donald J. Trump's frequent praise of Russian President Vladimir Putin, but never reminded Americans that Putin's bombers are killing innocent civilians in Aleppo, Syria, and prolonging the civil war. The negative reaction to an actor in "Hamilton" reading a prepared statement from the cast to Vice President-elect Mike Pence makes you wonder if we're still living in a country founded on free speech. For example, among the letters to the editor of The Record today, Paul Ferrantino of Wanaque claims that "as a retired professional actor, I am embarrassed by the behavior" of the "Hamilton" cast (8A). "Taking advantage of a captive audience, which included the vice president-elect of our United States, in this way was nothing more than a dirty trick, or at the least, an unfair way to espouse one's political views." "Dirty trick" or "unfair"? No way. The First Amendment is a reminder that President-elect Donald J. Trump was wrong to tweet his demand for the actor to apologize. "... No free pass is given on matters related to the First Amendment. The pun is intended. Trump cannot trump that. There is no [political] honeymoon for stomping on free speech" (8A). The prepared statement from the hit show's cast "raised the concerns of people of color, of immigrants and of the LGBT community that the new administration may not do them right," as the editorial puts it. "We truly hope," the actor told Pence, "that this show has inspired you to uphold our American values and to work on behalf of all of us." Good luck with that, given all the hate speech Trump indulged in during the campaign. But who can blame the cast for seizing the opportunity to speak directly to the vice president-elect in the hope the message will be delivered to the Dictator-In-Chief? The main element on Page 1 today demonstrates how U.S. Customs officials have bamboozled another reporter into writing a story on "banned foods" international visitors supposedly hide in their suitcases (1A). "Hundreds of pounds" of contraband are destroyed each week at Newark Liberty International Airport, the story reports. Is that really worthy of a front page that has only three stories on it? Staff Writer Monsy Alvarado is no kid just out of journalism school, but you won't find a word about any actual harm foreign pests or animal diseases have wrought in the United States. Customs officers should concentrate on stopping illegal drugs and guns from entering the country, and not obsess over worms in Portuguese chestnuts. Another big weakness in the story is Alvarado never explaining why visitors bother to stuff their luggage with foods that are widely available in supermarkets and specialty stores in ethnically diverse New Jersey. In Local today, Bergen County readers find stories from only seven of the 90 communities in The Record's circulation area, including three from Paterson and two from other Passaic County towns. And many readers note with horror that error-prone Staff Writer John Cichowski -- aka Road Warrior or is it Road Worrier -- apparently decided not to follow the example of many other staffers his age who retired during last week's drastic Gannett downsizing (1L). If they read The Record, commuters who ride NJ Transit buses into the city don't know whether a new midtown bus terminal is on or off. The latest episode in blow-by-blow coverage ran on The Record's front page on Monday, when Staff Writer Paul Berger reported on a "feud" between the Port Authority board chairman -- an appointee of Governor Christie -- and New York Gov. Andrew Cuomo (1A). With actual construction of a new terminal many years away, wouldn't it be nice if Berger tried to explain why there are no rush-hour seats on NJ Transit buses and why officials don't add more exclusive bus lanes into and out of the Lincoln Tunnel. Correction: The front-page story on the midtown Manhattan bus terminal ran on Monday, not Tuesday, as I said originally.